“You’re so lucky to travel to all these amazing places!” I hear this comment a lot. After 26 years in the travel industry, I certainly have seen my fair share of the world; all in the name of being educated about where I send my clients and what they are in for. They call them “educationals” for that very reason. Lucky? Absolutely – I love my work and would not change it for the world. However, the intensity at which we travel on these trips is not for the feint hearted and few people realise this. No leisurely lie-ins nor afternoon naps. No nips to the spa or dips in the swimming pool. Instead it’s early morning departures; hundreds of steps striding through lodges, camps and hotels; copious note-taking, in all kinds of weathers and temperatures. We cast envious glances at holiday-makers (a swirl around a resort in Zanzibar left me near to tears at the exquisite beach) and look with disgust at our feet that look like puffer fish after a grueling day. All the above is worthwhile when we catch the dying embers of a day while whetting our whistle with a gin and tonic overlooking the Ngorongoro Crater. Or fall into a beautifully dressed, comfy bed and drift off listening to lion roar in the Serengeti. 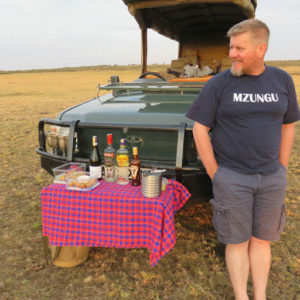 When the stars align, experience a morning such as I did at Sala’s Camp in the Masai Mara. 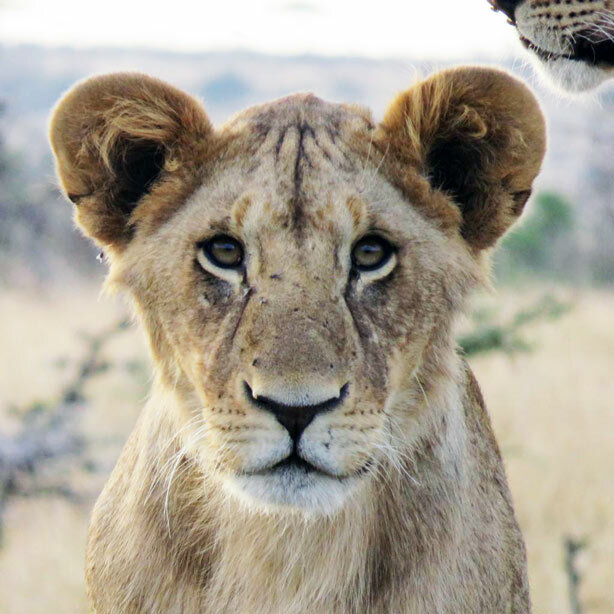 Notwithstanding all of the above and to my amazement as it was totally unexpected, I was about to experience a morning game drive that I can confidently say was the best I’ve ever had! After a cheerful early wake-up call, we slathered ourselves in sunscreen (the sun can be fierce even this early), dressed, and drained a cup of hot, sweet tea before joining our guide and tracker on the vehicle. Knowing that it was our last game drive, they asked what animals we would like to see. My husband had joined me for the last leg of my trip. We asked to see serval, leopard and lion. Both of us have been on many safaris (he used to be a safari guide), so we knew that the chances were slim. But aim high, right? 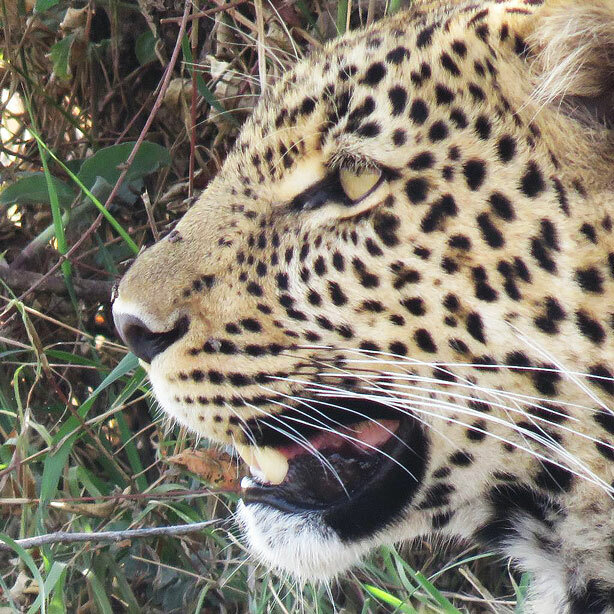 Very shortly after leaving camp, our Maasai tracker, Jackson, spotted something in the bush. 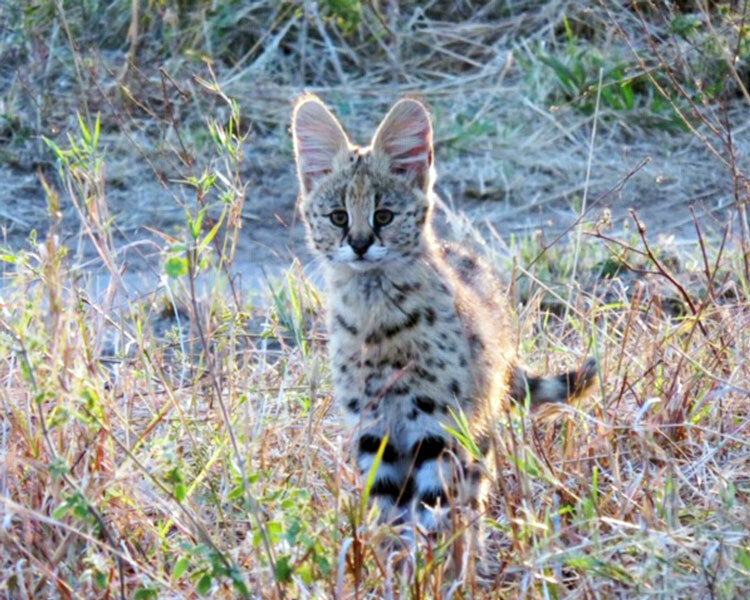 A quick dash in the general direction of his pointing found us within 10 feet of a serval and her fluffy kitten, who was prancing through the golden grass, as inquisitive of us as we were besotted with it, with its sweet face and oversized ears. 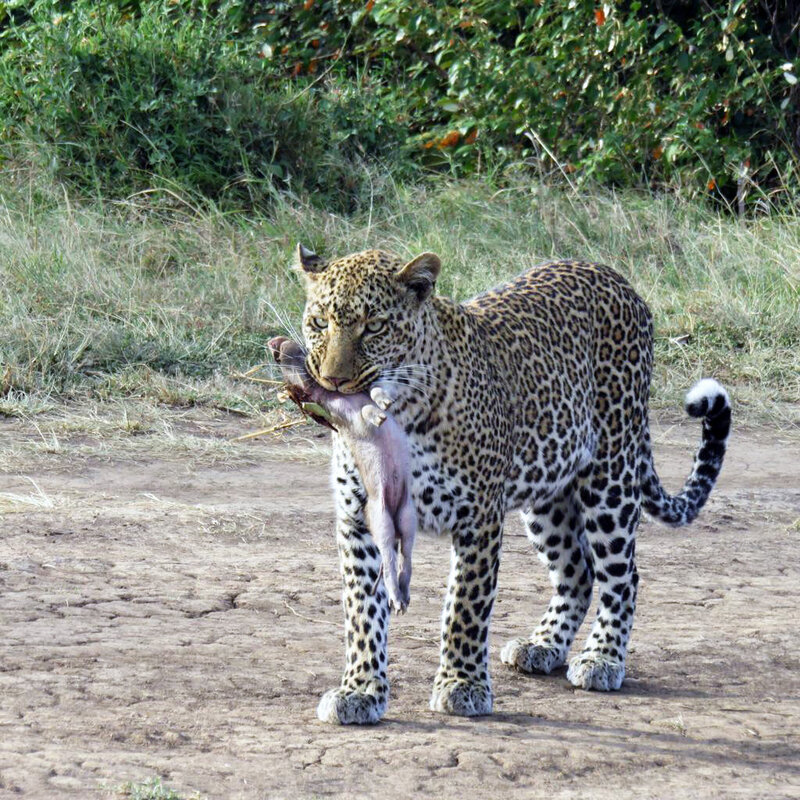 We could not believe our eyes, and even our guides conceded this was a lucky sighting. A few photos in that exquisite morning light later, mum and babe went on their way while we high-fived our eagle-eyed, grinning tracker! After spotting a large pride of lion, we followed their progress and watched them stalking and maneuvering around the biggest herd of buffalo I’ve ever seen. The beauty of Sala’s Camp is its location; inside the Masai Mara National Reserve for incredible game sightings, but far enough away from the madding crowds. So much so, that we saw another camp’s vehicle only after three hours of solitude! 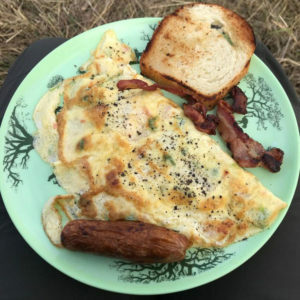 By now we were hungry and chose a tree under which to have our bush breakfast. On approach I noticed something that revealed itself to be a panting leopard! It’s often the shape and the movement that first reveals an animal, rather than the whole animal itself. Not believing our luck, we had a long time to admire her, exhausted and panting hard, before opting to have our meal under another tree to leave her in peace. 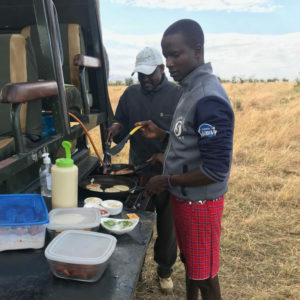 Our resplendently dressed Maasai guide Nixon and his sous-chef Jackson whipped up a delicious bush breakfast, while we guarded “our” leopard through binoculars. After a long while another vehicle approached and then another. We packed up and headed back to our rosette-spotted beauty. By now she was up and alert. Nixon found the reason for her panting; a dead baby eland draped over the branches of a tall tree, hidden from larger predators. Around the tree she wound herself, coming to a stop right in front of us, and peering right inside me. I’ve never experienced such an intense and close leopard encounter before; even Nixon let out a low whistle! By now it was time to head back to camp. Towards the stalking lion we went, only to bear witness to five lion cubs devouring a newly-departed zebra. The lucky buffalo were not on the menu today. One cub was inside the zebra, two were engaged in a heated battle over the best bits and the smallest cub was gingerly munching its way through the putrid entrails. Smelly? Yes. Incredible? You bet! I reiterate – the best game drive ever. Contact Sandi if you would like to find out more about planning a trip to Kenya.